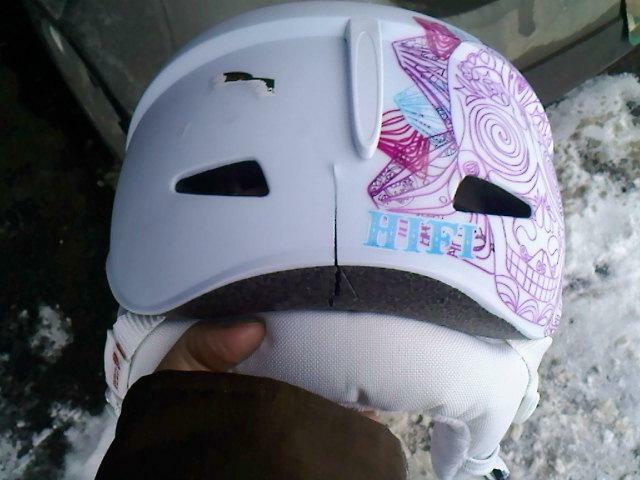 Stowe Mountain Helmets are Best! When it comes to skiing my daughter keeps saying "Yes, Mom, I know Mom!" or "Mom, I do this every weekend, I've got it". These comments usually follow me trying to lend her a face mask on below zero days or when I suggested she wear a helmet if she insisted on skiing the trees. WELL, I finally get to respond with, "See Mother knows BEST!". After her first face first digger into the snow she finally started wearing the helmet that a few of her friends and I insisted she wear. And can I tell you how happy this makes me.... very. And if you take a look at the above photo of her helmet, cracked, post crash #2, you'll see why! She lost control after hitting an ice patch on Hayride at Stowe with no edges, going at a high speed. Thank god she was wearing her new helmet, it was only the 2nd day it made an appearance! While she is claiming the helmet made her feel like it was OK to go that fast, I can tell she's very thankful she was wearing it. Now my "Slow down" and "Get your ski's tuned" comments are followed up with, "Already on it Mom".